Bitcoin's value has jumped to a record high, following a month of turmoil. The virtual currency reached $3,451.86 (£2,651) per coin in Monday trade, according to the Coindesk Bitcoin Price Index. It had never crossed the $3,000 mark until the weekend. 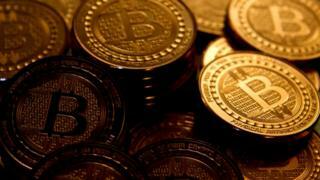 The market value of all bitcoins in existence has now surpassed $56bn (£43bn). The surge followed the creation of a spin-off crypto-currency, Bitcoin Cash, last week. The new asset is trading well below the peak price of $727.54 (£557) per coin it attained on 2 August. However, Bitcoin Cash's future does appear to be more assured after Coinbase, one of the leading exchange and wallet services, promised to support it after previously refusing to give such a commitment. "We are planning to have support for Bitcoin Cash by 1 January 2018, assuming no additional risks emerge during that time," it announced on its blog. The value of the original Bitcoin experienced big swings in July. First there was concern that there might be a "civil war" over rival plans to speed up transactions. That helped cause its value to dip to $1,938.94 (£1,485) on 16 July before a compromise scheme called Segwit2x gained favour. Then a fresh plan to fork the currency emerged from a group of insiders unhappy with the Segwit2x initiative. On 1 August, they offered investors a Bitcoin Cash token to match every original Bitcoin token they owned. The move created an incompatible version of the blockchain ledger, which keeps track of past transactions. The initiative had the potential to undermine the original Bitcoin, particularly if many miners had jumped ship. Miners provide the computer processing power to authorise transactions, and Bitcoin Cash was designed to appeal to their interests. However, it currently remains more profitable to mine the original Bitcoin's blockchain than that of Bitcoin Cash, and support for the new crypto-currency remains limited. "What this has shown is that Bitcoin is much more resilient to forks than some people thought," commented Michael Parsons, a blockchain adviser. "And it appears that there is room for more than one type of Bitcoin to exist." Another market watcher suggested that the introduction of Bitcoin Cash had actually contributed to the surge in the original version's value. "We've seen a lot of people selling their Bitcoin Cash in order to buy more Bitcoin," said Matthew Newton, market analyst at the eToro trading platform. "On top of this, some investors sat on the sidelines last week, waiting to see what happened, these investors are now moving back into Bitcoin." The total market capitalisation for all crypto-currencies - including Ethereum and Litecoin - was close to $118bn on Monday at 14:40 BST, according to CoinMarketCap.